I know this Thanksgiving stuff is going on and on and on here, but for us, the feast just happened last night since Thanksgiving Thursday proper was just another harvest day, and I am not the only one who has thanks to give either, so I happen to have more to share. 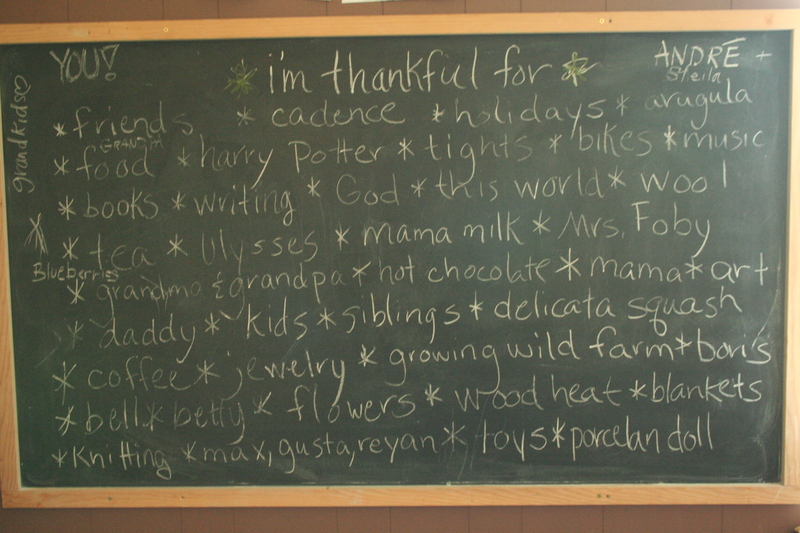 This was the list we made yesterday, with some of my own gratitudes thrown in, but mostly those of the small folks, a few of the farmer’s, and even some of Grandma and Grandpa’s and our friend’s who joined us in celebrating. This morning, after what ended up being a late night of good cheer and intense scrabble competition, I felt the impulse to reach for a complaint when faced with the need to hurry up and write a CSA newsletter on a Monday mid-morning with a very busy baby getting into all kinds of trouble, a task normally tended to Sunday morning with some measure of leisure and a papa who is helping the kids. But complain? How can I. The blackboard is filled with these words, my heart is still lifted by my own thankfulness, and there is just nothing worth complaining about, absolutely nothing. You couldn’t have said it any better, a heart can certainly be lifted by thankfulness. We didn’t get around to giving our thanks until Friday and while we only did it verbally, we have quite a long list of thanks, too. And so little to complain about really. I love your list.